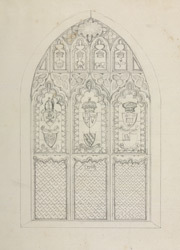 A drawing of the great east window of St Wilfrid's church in Kirkby-in-Ashfield Church in Nottinghamshire. It was presented to the church by the Rev. Sir Richard Kaye, Bart. - Grimm's patron - when he was rector of the parish. Kirkby-In-Ashfield is five miles south-west of Mansfield. The chancel walls of St Wilfrid were added to the church in the 13th century. The east window was rebuilt in the Gothic Perpendicular style in 1768 by Kaye. It features the coats of arms of important families connected with the parish. The church was mostly destroyed in a fire in 1907.